AP Photo Loveland native and Team Breckenridge alumnus Jeremy Bloom celebrates as he crosses the finish line after winning a spot on the U.S. Olympic team during the freestyle moguls team trials in Steamboat Springs on Friday. STEAMBOAT SPRINGS – Jeremy Bloom is going to the Olympics for the second time. 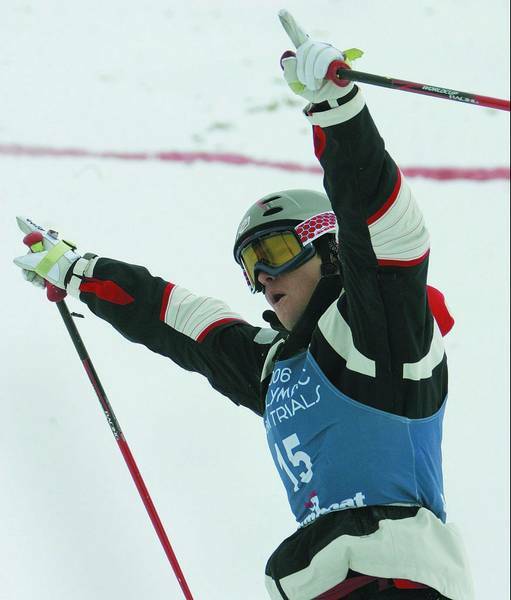 By winning a wildcard spot at the U.S. Olympic qualifier moguls event in Steamboat Springs on Friday, Bloom – considered by many to be the 2006 gold medal favorite – officially punched his ticket to Turin, Italy.He threw a huge 720 with an iron cross off the first hit of the course on Steamboat’s Voodoo Run, then gathered speed as his feet bounced like synchronized springs over each bump and finished with an off-axis 720 D-spin. The clean combination gave him a score of 27.82 points. Bloom was the 2005 world champion and won a record six straight World Cup events last season. As for his performance Friday, U.S. freestyle head coach Jeff Wintersteen said Bloom and his teammate Travis Mayer, who went to high school in Steamboat and placed second in the qualifier, just a fraction of a point behind Bloom (27.57), put down perfect runs.”(Bloom’s) and T. Mayer’s were gold and silver in Torino,” Wintersteen said. “They were flawless today, both of them.”Vail’s Toby Dawson – another former Team Breck skier – took third, but he felt his run was top-notch and was frustrated with his result and 26.84-point score.Team Breck alum Luke Westerlund finished eighth (23.21), while Team Summit alum Dave Babic took 12th (14.49). Teenager Kearney earns ticket to 2006 GamesOn the women’s side, meanwhile, Hannah Kearney woke up before her alarm went off Friday, then went out and clinched the U.S. wildcard spot for the 2006 Olympics.The red-hot 19-year-old from Vermont will turn 20 on Feb. 26, a few days after competing in the Turin moguls event. Last season, she was the women’s world champion in moguls. She won the first World Cup event earlier this month in Tignes, France – already her 10th World Cup podium. “The only one that really competes against Hannah is Hannah,” the U.S. coach Wintersteen said. “When Hannah skis well, I think she’s the best (female) skier in the world.”After a shaky qualifying run and equally inconsistent runs before the final, Kearney put down a fast, tidy run for a score of 26.66 points, just ahead of New York’s Jillian Vogtli (26.40) and Shelly Robertson (26.37) of Squaw Valley, Calif. Breckenridge resident and Team Summit alum Heather McPhie finished seventh (25.04).Shauna Farnell can be reached at 949-0555, ext. 14632, or at sfarnell@vaildaily.com.